In December 2016, Amanda and Jeremy celebrated the birth of their twins, Isabelle (Izzy) and Isaiah. Just over a year later, they were back at that same hospital, receiving heartbreaking news. Izzy had what her parents thought was some kind of diaper rash. Several doctor visits and multiple tests later, Amanda and Jeremy still didn’t have answers. When Izzy’s rash turned to bleeding, her parents took her to the emergency room. It was that night that doctors told them what no parent ever thinks they’ll hear – Izzy had cancer. Her tumor was later diagnosed as a germ cell yolk sac tumor. Things moved quickly after that hospital visit. Izzy’s diagnosis was confirmed and she started chemo that week. Her parents pulled her out of daycare, made arrangements for grandparents to stay with Isaiah while they were at the hospital and called their employers to take time off. Izzy’s parents said all the adjusting they did right away left little time for the news of Izzy’s cancer to really sink in. In fact, it took them a while to even say out loud that Izzy had cancer. Doctors have described Izzy’s diagnosis as one in a million, and that’s exactly how Amanda and Jeremy see Izzy. Her personality showed through chemo treatments – she would have ‘dance parties’ in her crib when her energy was up and tease doctors and nurses by pretending to give them a toy and then pulling it back from them with a giggle. She loved playing with the bubbles that child life specialists would bring in to distract her from needle pokes and scary procedures. Despite nausea caused by chemo, she would still eat a handful of random foods: three-bean hot dish and barbeque were among her favorites. Things were looking up for Izzy a few months into treatment – in April 2018, scans revealed that the chemo had done its job and the tumor had shrunk down to nothing. After a summer of bike rides, play dates and trips to the zoo, Izzy’s tumor came back. She had to start her difficult fight all over again. Amanda and Jeremy said their perspective as parents has changed significantly since Izzy’s diagnosis. 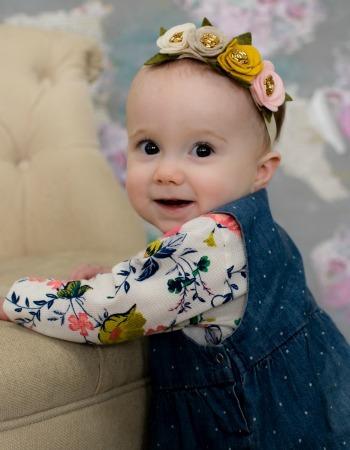 They feel lucky that Izzy’s tumor was highly treatable and that she’s been able to stay healthy throughout all of her chemo treatments, especially since they’ve seen so many families with very different stories. Izzy’s most recent scans in January were clear, though doctors are still keeping a close eye on her, just in case. Amanda and Jeremy hope Izzy can stay healthy and grow up to have a normal life, but they know the signs and consequences of cancer and its treatment will always be there. Because of the location of her tumor and the chemotherapy used to treat it, her parents are unsure if she’ll be able to have children someday. They say they don’t yet know how or when to explain to Izzy all the difficulties she’s gone through in the first years of her life. These are things no parent thinks they’ll have to consider when their daughter is just a toddler. However, Amanda and Jeremy say they are thankful when they look back and hopeful when they look forward.